If you’re a business owner, you might not know what Magento is and confuse it for a Marvel super villain. However, it’s probably one of the best e-commerce platforms available today…so what is Magento? Magento is an all-in-one open source solution e-commerce platform that allows you to easily promote and manage your products in a shopping cart system. Read more about the benefits of Magento here. Our team at Ready Artwork have been developing shopping cart websites with Magento for many years and recently our lead programmer Michael became a Magento Certified Front End Developer. The certification is designed to single out the very best Magento experts through rigorous testing. 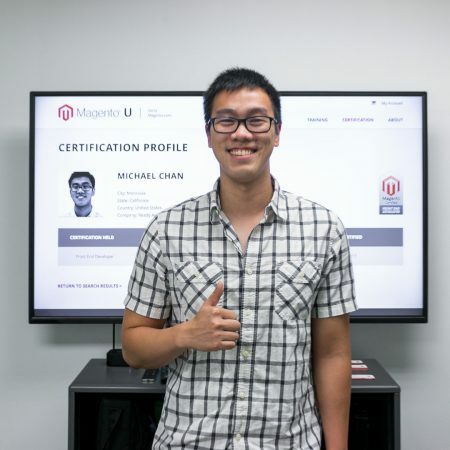 This means that Michael passed the Magento Certification Developer exam and has demonstrated that he understands Magento’s theming components and the ability to modify the user interface according to best practices. So why should you hire a Magento Certified Developer to create your e-commerce website? Since Magento is an open source platform, this means that there aren’t any strict rules of coding but Magento does have their own set of best practices for website development. A Magento Certified Developer not only knows how to code, but also understands those standard best practices of building a website. This means knowing how to best integrate business practices into the site and knowing how to make design decisions on the coding level. There also will be consistent structure in the code and this will make debugging faster resulting in faster coding which is great for you and our developers. Ultimately the reason why you would want to hire a Magento Certified Developer is so that you can have the best for your online shopping cart. Using a team with Magento Certification will ensure efficient and clean code development, more security, and easy upgrading in the future. There is a sense of reliability and trust when your business hires Certified Magento Developers. These skills are especially important because this means that Ready Artwork developers have the skills to code a site, while also implementing business practices and smart design techniques. While hiring a freelancer may be less expensive than a professional Magento certified developer, hiring an experienced and trained developer will save your business money in the long run. You don’t want to hire less experienced freelancers just to find bugs later on or even have to redo your website. In the end, hiring a Magento Certified developer will save you money and time. Who doesn’t want that? Not only does a website created by a Magento certified developer have better UI/UX, but it will also be listed and found more easily by search engines like Google. It will also be easier to perform SEO if the website has been built by a Magento certified developer. Magento certification is not just a piece of paper or a digital badge on a website, it is assurance of Ready Artwork’s expertise and credibility in front end development. It’s crucial for your business to hire Magento Certified Developers to optimize your e-commerce business. Contact Ready Artwork today to see how we can help boost your e-commerce Magento website!